It’s been a VERY long time since I’ve posted anything here. But I’ve kept the domain alive, at least on the hosting side of things. I could make excuses as to why I hadn’t posted anything up in regards to any work going on, even if, the only work was privately working on Legends from Thyilos. But I won’t. fact is, I was too lazy and after such a long time gone quiet, I’d become over anxious to be able to post anything. So here it is, the grit. I’ve been a four month hiatus from working on Legends from Thyilos, mainly because work and life have been too baring to allow me to even think of touching the project. This situation has forced me to reconsider something I’d thought about last year when RMMV was due to be released. Where I wondered about ceasing production on the project using the very out dated RMXP. Part of the my reasoning stemmed for why I opted to stay with RMXP to begin with, and that was it’s setup was not too far different from the RPG Maker 2000 which got me started in this hobby in the first place. So I kept working on it in XP, but I have always wondered. Well, now I’m taking a huge step back, in order to leap forward. RMMV will allow me to set the game up for future project centered around the universe I’ve been creating for so long, without having to worry about doing it later. There’s also the added fuel of making it available on Mac and Windows, and if luck provides, it may even get the Green Light on Steam. It also gives me more practice in the engine me and a friend of mine are making a side project on called, Whisky Quest. Which to be honest, may never actually see completion, but for the mean time, working on the script together has been an excellent pass time and has given me the breathing space of focusing entirely on Lft Hot4K i needed. So I’ve made a post up on the Dev site, Lucid Flame, detailing what’s being planned, and I won’t dilly dally retyping everything in here when I could use that same time to get back to work. Typing this update is just a little break to sip some whisky and collect my thoughts before I delve back into rebuilding the database and converting what salvage assets from the old engine I can. So I’ll leave it at that, and will hopefully, have the nerve to post updates on here of what;s going down. If there isn’t anything here, then please, keep in touch on the Dev site, just in case I’m voicing myself on there rather than here. With no actual updates to update on, and a little guilt that nothing was updated in the prior weeks, I do have one little event that almost set me back again once more. Or at least potentially so. Some friends of mine had convinced me to Guild Wars 2, which is an MMORPG (Massive Multiplayer Online), if you’ve never heard of it. Originally, I’d borrowed the installation files and set everything up at home, eagerly awaiting a chance to get into a Virutal World once more like I once had many years ago. My previous MMO had been Perfect World International, and the beautiful environments and interesting narratives and characters had always been inspiring, as well as a opportunity to escape for a bit and socialise with some international or outer state friends in a gaming environment. GW2, from what I’ve seen and been told, is even more so enhanced on those features, and aside from chances to catch up with old friends, the detail and dedication the artist put into the creation of the word is quite remarkable. So I’m hoping it’ll boost my ideas for my own projects. But back to the point of the story; after installing, it turned out there was a 12gb Download it needed to do with patches and features. My internet is both slow, and almost capped, so I’d taken my computer back to my friends to receive the straight up files, and if the game didn’t run. She has Unlimited internet to use to download it. I’ll skip the happy dance and other stuff; since it worked and get to the topic. Upon departing and carting my equipment back to my car, my monitor slipped from my grip and hit the ground. Fortuantly, I’ve always transported it with a piece of the orignal foam casing over the top of the screen, and this saved it from being broken completely. But the bottom of the rame has either moved out of the place, or, the screen has shifted and is now titled backwards a bit from the bottom. So here’s my dilema. Even though it still functions fine, it’s not in its proper place. There’s a good chance the dust floating in from the dirt road I live on will eventually get in the exposed opening and damage the circuitry. I’m thinking since the monitor came free with my computer since it was during a sale, that I can take it apart without fear of voiding any warranty. Or I could take it to a technician to do it, which I’d think would only set me back $50 at most. Still a lot less than a new monitor. Otherwise, I may crumble to my urge to pull the screen apart myself ‘examine’ the interior like I did my laptop when it ceased working. On another note, I’ve been doing a bit of a commission for a friend lately, who I’d hoped after composing the final mock-up, I’d be able to contact and get his opinion before I started matte painting over it. But seeing as I have to be able to contact him, I’ll just have to go ahead with it. I aim to finish before the end of the week, and will link the finished product up here. I’m still a bit rusty with my Wacom tablet, but after some playing around every now and then, I’ve slowly started to regain my knack for it. This is just a short little post to highlight a new project that was finally made public. Me and the others over at Lucid Flame decided it was time that a large collaborative project we’d been discussing and slowly working on over the last year had reached its time to take a spot in the limelight. For now though, there is only going to be updates and features about the new game, Thief of Time, over on Lucid Flame, until it of course reaches a point where there’s enough information for it to be made public on RPG Dev Forums. So the last week so far, I’d taken upon something a little more different than normal. Some readers may remember I’ve been looking for work for quite some time now, both in the industry I’d trained in during my Diploma’s at TAFE. but also in other fields as a source of stable income. I may still be living at home, but I do need to pay board, and pitch in on things when possible. So this week I was able to get a chance to try out working as an apprentice Pastry Chef. It felt natural to take on something involving food, since the only real work I’d done prior was also in a hospitality environment. I’ve gotta say, after my trial run, it’s tough work (which was what I’d expected), and I did enjoy the things I’d learned during my time there. But, the apprenticeship needs someone who has the drive and dedication to see into their future and say, “I want to do this as a career!” So though I did enjoy my time, I could not see myself still with a desire for the industry 3 years onward. So I’ve left that job, and hopefully the next person they take on for a trial run will take up the offer. On an upside, it’s good to do some work. I’m not talking about the odd commissions or projects I’ve taken on personally, but getting out into something more physical. Even though it was a short time, I’m feeling rather invigorated, and my motivation to seek work has gone right up. I’m even a little less nervous towards other hospitality fields. (my first job working as a hand in a kitchen rather ruined it all for me). So that’s that for this week now gone by. I’d have hoped that when I did post an update on here, that I’d have had something a bit more related to design, but I’m thinking from the perspective now that any post is a good post, and if I can get into a routine once more, then I’ll be making at least one post per week. While I am thinking on it though, I’m intending to go back to some old VFX projects that I’d attempted to create during my old laptops “dead-graphics-card” phase. One in particular I did for Red Stone Magic, I’d wished to create a complex 3d animation of pistons and circuits, but was left constructing it all in After Effects with OpenGL rendering turned off so it wouldn’t crash as soon as I tried to manipulate something in 3d space. It’d be a good opportunity to get back to using Lightwave once more now I’ve obtained LW 10.1; not much on an upgrade from 9.6, but I’ve been told there’s a couple nice changes which I’ll hopefully pick up on. If not, there’s always Google. So that’s all for today,and hopefully I will adhere to routine and post once again in the coming week! Sticking to the title right there, I’m literally doing exactly what it says. I’m trying to break my habit right now of being lazy. Seems since my laptop broke down, I lost all work motivation and albeit, slipped into a bit of depression. So lately all I’ve been doing is aimlessly browsing the net, and trying to find actual work so I can get some money on my plate. Which isn’t entirely a bad thing, since finding a job is important; but my old hobbies were once my dream to be my job, and I can’t just forget about them. Truthfully, I feel very guilty about my lack of work ethic, so over the last month I’ve been forcing myself to do a little bit at on something, but each time I do start I only get a little bit done and then get distracted by something else. But I’m going to change that right now! It’s time to go back to %100 focus. Normal sleeping hours, normal waking hours, and I think I’ll kick my caffeine addiction and drink more tea instead to limit myself. Then i can go back to posting updates here, rather than feeling like its pointless because there’s nothing to post an update about (which is kinda ironic since over on LucidFlame it’s me who was always telling the others they should post updates on their work regardless of how small it was, just so the readers know what’s going down. Talk about a taste of ones own medicine). This is a large one, so rather than clog up everything here, I’ll just link it back to my DeviantArt page. 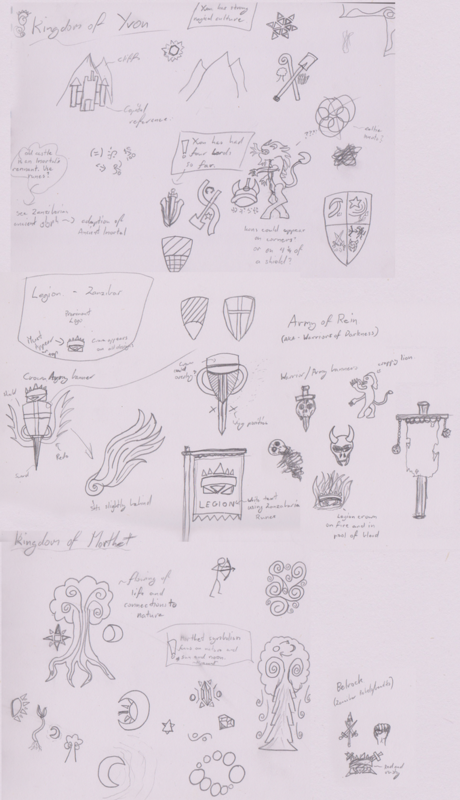 The image is a collage of the kingdom banner designs I’d bee working on while my laptop was dead, which I recall in a prior post over a month ago, I said I’d upload… better late than never? I haven’t done enough with the full vector version of these, however, to warrant uploading those just yet, but I will hopefully do so soon. That’s it from the work I do have to put up on display. Aside from these, Legonds from Thyilos has still been progressing, slowly. I’ve lacked motivation for doing actual work on it, so I’ve instead been doing other written pieces associated with its lore. One of the bigger pieces is a written journal by a rather important figure-head in the series, called Rein. I was thinking of doing a biography of him, but when I truly considered it, and the man Rein does become, a biography became impossible! There is not a single sole alive throughout Thyilos or any other dimension who would ever be able to get close enough to actually interview Rein. So instead, his background is narrated through him by way of a journal. It starts off when he is only ten, and goes on from there. I’ve got some ideas in my mind about twists and such that could be precursors to the man he becomes today, but I’m still a while off from there. It’s a bit of a challenge though to write this journal though. mainly because even though he’s from a wealthy family and has the proper education, he’s young. So I’m having to write as a young boy would, not as I would write today. it’s all a part of showing his growth. Another key reason for doing a journal instead, which I thought was rather a good plan, is that if Rein were to still keep journals to the current date, then that would show his human side. Even though he is current meant to be a mad, near-inhuman monstrosity whose selfish ambition is to annihilate and control the world as the one dominate ruler. He is still a human, somewhere… really deep down… Maybe inside that black void of a soul he has? Who knows. But if it exists, and it might, even if just a teeeeeeny bit. It’d be noticeable in his journals. Which, unlike getting a biography. It’s possible to steal Rein’s things, provided someone were able to somehow get inside his dark castle and do so. Before I depart once more, hopefully this time not for more than a week, I’d like to announce a new member to the LfT production team. A good friend of mine, David R, has agreed to being the games musician, and he’s already presented his first piece of work; a remix of the default theme I’d been using for the games title screen. I’ve high hopes for this partnership, and am elated to have the chance to see someone create music to fit the narrative. Depending how things progress, me or he, my put up the audio examples for people to hear. That’s all from me folks. Hope you’re having a good start to the week! After a not so much to plan 3 months, I’ve finally gotten a hold of a tasty new computer! It put up a bit of a struggle when there were some hiccups with getting it installed and configured right, but its now going at full power and ready to take on all the bits and pieces of work I’ve had on hold for way too long! That said, I’ve still got another day before I can actually jump into any major work, because it’s still taking a good day to transfer over files from my external that were recovered from my ex-laptop; along with getting necessary programs and such installed and updated, etc. I am jumping back into working of Legends of Thyilos, a game which was meant to have a Beta Demo 6.2 released, quite coincidentally, the night after my laptop ceased all function. The 3 month over-due patch release will hopefully go up tomorrow night (Friday), and then with all major bugs having been taken care of, I can set sail for the Full Demo release sometime later. My estimate was July 31st, but I’m not all too confident I can make that date due to other projects; ie Within 10 Minutes tutorials and getting back into a routine of making animations in After Effects and the like. So the Demo will probably go up in two months from the Beta 6.2. Enough time for myself to tackle it head-on and get some major features fully implemented! I’m pretty ecstatic about it! There’s some bits of work I’ll be scanning onto the computer in the coming days, and then finishing them up in Illustrator and Photoshop. I might stick up the sketches on here, but since they’re all game project related, I might slip them onto the Lucid Flame site instead; but I’ll be sure to link back here. As for my novels, I’ll be trying to get back to them. I never did manage to get anything done on them, both to a lack of motivation, looking for work, and constant house-work and renovations going on. But its something I will not let slip into back of my folders. Eventually I’ll return to working on UNTITLED, and I’ll also pop out the lost final chapter for Samurai 2020. While I’m rambling about novels though, I’ve concluded that the Thyilosian Lore book I was working on is not going to work out, as the knowledge specified would not fit into the current time and perspective. So the book will be broken into a series of different books. The current Thyilosian Lore will be a collective knowledge of the world so far, excluding any knowledge about the “Shroud”, a impassible barrier which is meant to have a whole kingdom within it. The next will be inside the Shroud, and be a collection of knowledge from that, and I’ll work on this when the games relating to within the Shroud commence. The third is a Biography of Rein; an evil tyrant who caused the utter damnation of part of the Kingdom of Zanzibar, and launch a genocidal campaign. The bio will give a look into the region he reigns over both before and after, and also shed light into the mad mans min. The last book, will be like a lost tome written by the Ancient Immortals when they still existed. it’ll contain their own personal history and be more like a log book of key events and such. It’ll go as far as up to the Calamity, when the Immortals disappeared. It'[s going to be a lot of work to get these done, but thankfully I have good friend willing to proof read and tell me where I screw up so that each book works! I’ll be going back to regular postings soon, and I might put up my new computers specs later just for a random post. It should be able to tackle some intense 3d, but my real test is going to be going into Minecraft, a Java-based mining/exploration.adventure/sandbox/building game you may or may not have heard of. And seeing how big a cubeic stack of TNT I can detonate at once before the game completely crashes. A friend of mine could manage 100×100, and he has a pretty powerful laptop. I’m hoping my machine can hit 200×200! That was the sound of me appearing through a cloud of smoke wearing a ninja costume! Because I am apparently like the wind and can do awesome ninja stuff like that. I’ve stolen away the computer at a friends in order to drop by onto here while I hurriedly check the accumulation of emails from around four weeks! But I didn’t just slip onto here to describe myself being a ninja, I slipped along in order to announce that the previous delay for when I can get a new computer is a lot closer than originally thought! It’s just a simple matter of saving up the last few hundred, then getting together some brain trust to find parts to build a new computer! Preferably something that can render out in 1920×1080 HD 3d models with lots of lovely delicious details on it, and 3d modelling is a definant to return to! Especially since I keep getting notifications about people subscribing to the Studio Wisp Youtube page, in which I am certain are mostly there for the 3d Tutorials that were put on Hiatus when my laptop lost the ability to do anything involving OpenGL. I have other great news though! When I was getting information extracted from my laptop, things were taking a WHOLE lot longer than expected. Turns out the drive had seriously done itself over. Only a few tiny scraps actually made it over from Drive C, nothing really useful. But to my great relief, Drive D, though slow, did eventually transfer its files over, and Drive D is exactly where the Project Files are stored, namely Legends from Thyilos, which means as soon as I can get a new computer that project will be right back on the go. A Beta 6.2, meant to have gone out literally the day after my laptop died, will be finished and uploaded as soon as possible in order to take care of the bugs I knew about, and some bugs others have come across. On he topic of game projects, the LF team might be announcing another little project soon too. I might have mentioned it already here, or perhaps just on the Dev team site. But it’s seen some progress, and though we may not yet be able to start on its actually development, there could be some little illustrations to get the juices going in anticipation for its call to go! I think that’s all the news I have. The house, since the floods last November, is finally being put back together. The flooring in the lounge-room and kitchen is first, then the hallway and bedrooms. Once they’re in, the new furniture can come in, and if I’m really lucky, the computer will follow shortly after. It feels good to know the house will be back to normal. The winter mornings have been quite chilly, and having no curtains or carpet has rendered the heaters a little useless as the house can’t hold much heat. Ah, one other thing before I disappear again. I’ll be helping out a friend with a short film he’s doing for his Uni course. I’ll be playing the role of an Ice Mage! Should be good fun. If he does happen to upload the film at some point in the future, I’ll be sure to link it up. He’s going to be some tasty VFX and from our conspiring last night when he showed me the script, some crafty cinematography too. It’d be interesting to see if any of those tricks are picked up on.